We are proud to be a part of the erase initiative and welcome you to learn more about how we can all promote a peaceful school life without bullying. erase (expect respect & a safe education) is a provincial strategy for creating safe, inclusive and welcoming school cultures that will support student learning. Part of our program at WMA is helping children understand that all living creatures are important and interconnected. Maria Montessori believed education was the most powerful and universal way through which to reconstruct society. Daily, we strive to create an environment that will promote the development of peaceful individuals. 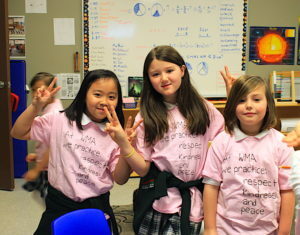 We invite you to read through our posts on this site to give you a look at how peace operates in our classrooms. The erase strategy is a comprehensive approach to promote positive mental health and wellness and prevent bullying and violent behaviours in schools. The strategy includes a coordinated approach involving schools, families and community partners.